By designing a pixel with a deeper well, photons with longer wavelengths can be more efficiently converted into electrons, providing a substantial increase in quantum efficiency (QE) in the Near Infra-Red region. This deeper well resulted in an almost 45% increase in QE at 800nm versus the standard monochrome 19µm pixel size sensor (Canon 35MMFHDXSMA CMOS sensor). Featuring 19µm pixel sizes available in monochrome (35MMFHDXSBM) or with a specialized RGB-NIR color filter array (35MMFHDXSBI), this new family of Canon CMOS sensors allows for expanded possibilities in a wide range of applications. 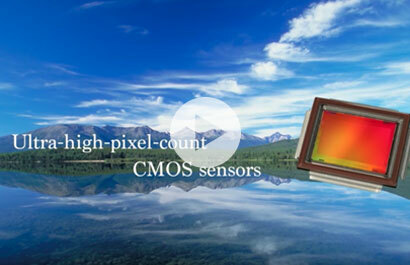 The 35MMFHDXSB Canon CMOS sensor features enormous 19µm pixels, each with an expanded well depth for greatly enhanced quantum efficiency (QE) for increased NIR detection. New technologies in pixel readout reduce the noise associated with larger pixel sizes, allowing for high quality images, even in low-light environments. By replacing one of the green filters with an NIR filter, this CMOS sensor also allows for the separation of visible and NIR wavelengths for discrete analysis and simultaneous detection in each spectrum. With full resolution of 2160 x 1280, the 35MMFHDXSB CMOS sensor from Canon offers a wide image capture area.